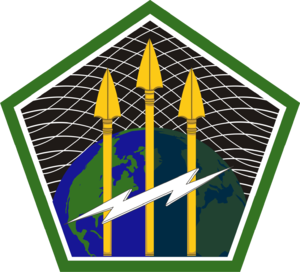 U.S. Army Cyber Command (ARCYBER) conducts information dominance and cyberspace operations as the Army service component command of United States Cyber Command. Army Cyber is the Army service component command supporting U.S. Cyber Command. The Army achieved an initial cyber operating capability in October 2009 by employing the Army Space and Missile Defense Command/Army Forces Strategic Command (USASMDC/ARSTRAT) supported by NETCOM/9thSC(A), 1st IO CMD (L) and INSCOM. The command was originally announced to be named Army Forces Cyber Command (ARFORCYBER). The command was established on October 1, 2010 with the name Army Cyber Command (Army Cyber), commanded by then-Maj. Gen. Rhett A. Hernandez. There are plans for the command to move to Fort Gordon, in Augusta, Georgia home of the United States Army Cyber Center of Excellence, the U.S. Army Cyber Corps and Signal Corps. ^ U.S. Army (2 Jul 2010). "ARFORCYBER Headquarters Stands Up in National Capital Region". army.mil. Retrieved 27 December 2010. ^ "HQDA General Orders No. 2014-02" (PDF). Archived from the original (PDF) on 21 November 2014. Retrieved 14 April 2015. ^ a b US Department of Defense (24 May 2010). "DoD Release No. 420-10 Establishment of Army Forces Cyber Command". defense.gov. Retrieved 24 May 2010. ^ Amber Corrin (9 December 2010). "Army CyberCom faces tough challenges getting started". defensesystems.com. Retrieved 27 December 2010. ^ U.S. Army (9 Dec 2013). "1st Information Operations Command (Land)". inscom.army.mil. Retrieved 9 Jan 2014. ^ US Army (1 October 2010). "Army establishes Army Cyber Command". army.mil. Retrieved 27 December 2010. ^ Belvoir Eagle (7 October 2010). "U.S. Army Cyber Command stands up at Belvoir". belvoireagle.com. Archived from the original on 7 July 2011. Retrieved 27 December 2010. ^ Henry Kenyon (14 October 2010). "Army cyber unit guards computer networks". defensesystems.com. Retrieved 27 December 2010. ^ Army Public Affairs (1 October 2010). "U.S. Army Cyber Command Assumption of Command Announced". defense.gov. Retrieved 28 December 2010. ^ "Army Settles On Augusta For Cyber Forces Headquarters". nextgov.com. 20 December 2013. Retrieved 22 December 2013.